Q. My bonnet and roof on my red car is white and pink faded do i need a respray? Q. My alloy has a spoke ( or finger ) scuffed from a kerb but the rest of the alloy is ok do i need a full refurb? A. You can do the same smart repair process on a single alloy at a fraction of the full refurb cost. 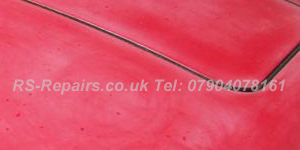 Q. I have a golf and the rear wheel arch edge was clipped on a wall and has scuffed the paint down to metal do i need the whole qtr panel sprayed? A. 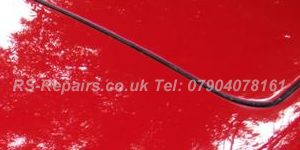 At RS Repairs we match your paint and mix it in the van to the correct shade, with this we do a local repair only taking in the wheel arch area then fading and polishing in the edges so you have a invisable repair and do not have to spend on a whole panel being sprayed . Q. I have a split in my bumper do i need to replace the bumper? A. There is an 80% chance we can put a plastic weld in your bumper regaining the strength then filling the area and spraying in colour. Q. My bumper is textiled black and has a scuff can it be repaired? A. Yes we can retextile bumpers in any colour black, blue, and grey.